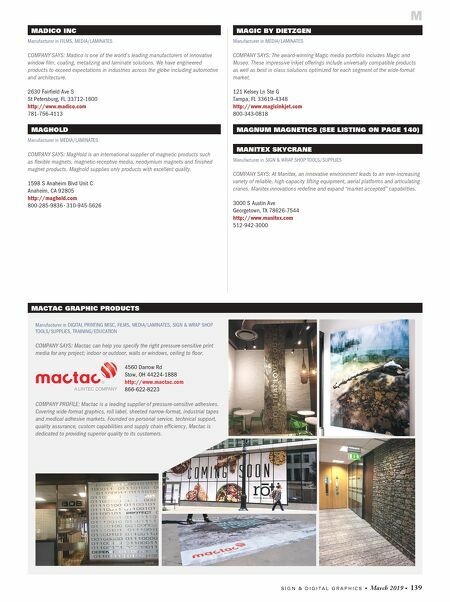 S I G N & D I G I T A L G R A P H I C S • March 2019 • 139 MAGIC BY DIETZGEN Manufacturer in MEDIA/LAMINATES COMPANY SAYS: The award-winning Magic media portfolio includes Magic and Museo. These impressive inkjet offerings include universally compatible products as well as best in class solutions optimized for each segment of the wide-format market. 121 Kelsey Ln Ste G Tampa, FL 33619-4348 http://www.magicinkjet.com 800-343-0818 MAGNUM MAGNETICS (SEE LISTING ON PAGE 140) MANITEX SKYCRANE Manufacturer in SIGN & WRAP SHOP TOOLS/SUPPLIES COMPANY SAYS: At Manitex, an innovative environment leads to an ever-increasing variety of reliable, high-capacity lifting equipment, aerial platforms and articulating cranes. 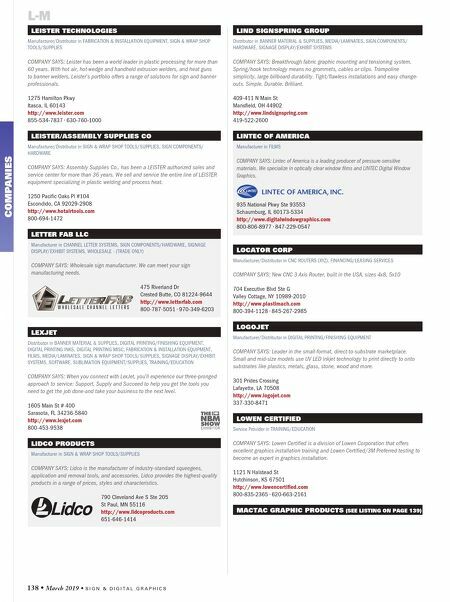 Manitex innovations redefine and expand "market accepted" capabilities. 3000 S Austin Ave Georgetown, TX 78626-7544 http://www.manitex.com 512-942-3000 MADICO INC Manufacturer in FILMS, MEDIA/LAMINATES COMPANY SAYS: Madico is one of the world's leading manufacturers of innovative window film, coating, metalizing and laminate solutions. We have engineered products to exceed expectations in industries across the globe including automotive and architecture. 2630 Fairfield Ave S St Petersburg, FL 33712-1600 http://www.madico.com 781-756-4113 MAGHOLD Manufacturer in MEDIA/LAMINATES COMPANY SAYS: MagHold is an international supplier of magnetic products such as flexible magnets, magnetic-receptive media, neodymium magnets and finished magnet products. Maghold supplies only products with excellent quality. 1598 S Anaheim Blvd Unit C Anaheim, CA 92805 http://maghold.com 800-285-9836 • 310-945-5626 M MACTAC GRAPHIC PRODUCTS Manufacturer in DIGITAL PRINTING MISC, FILMS, MEDIA/LAMINATES, SIGN & WRAP SHOP TOOLS/SUPPLIES, TRAINING/EDUCATION COMPANY SAYS: Mactac can help you specify the right pressure-sensitive print media for any project; indoor or outdoor, walls or windows, ceiling to floor. 4560 Darrow Rd Stow, OH 44224-1888 http://www.mactac.com 866-622-8223 COMPANY PROFILE: Mactac is a leading supplier of pressure-sensitive adhesives. Covering wide-format graphics, roll label, sheeted narrow-format, industrial tapes and medical adhesive markets. Founded on personal service, technical support, quality assurance, custom capabilities and supply chain efficiency, Mactac is dedicated to providing superior quality to its customers.